Benjamin Feldmann is a landscape architect and urban designer with 20 years experience who integrates ecologically sound, system-based thinking into his work. Ben seeks solutions with environmental synergies between built, social, and natural spheres as he strives to build resilient communities and promote urban regeneration. 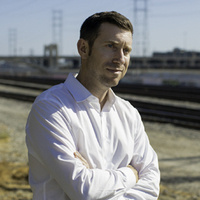 After completing his degrees at CalPoly, San Luis Obispo and UC Berkeley, Ben worked for international firms such as HOK (Hellmuth, Obata+Kassabaum, Inc.) and taught at the Centro de Diseño Arquitectura y Construcción in Honduras, prior to returning to California as a Principal at Studio-MLA in Los Angeles nearly 10 years ago. Mr. Feldmann will discuss current and past revitalization and restoration projects along the Los Angeles River. From placemaking plans and restoration studies to the literal building of bridges to safely connect communities east and west of the river, Studio-MLA urban designers, landscape architects, and GIS professionals apply ecological thinking to urban environments. Come learn more about these projects and advocacy initiatives that promote community involvement and resilience that align with geodesign principles.